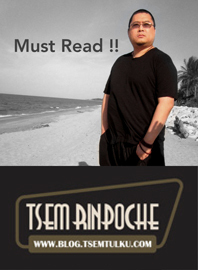 Written at Drepung Chokyi Dechen at the request of the two meritorious Drungtrapa Palzangpo brothers, by Lama Tashi Palden, a Buddhist monk and teacher who had searched many hundreds of thousands of scriptures with the lights of his wisdom. Listen for but a few moments. To delight all sages, I have composed. 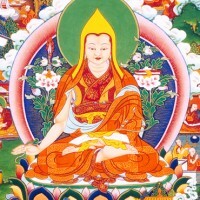 O glorious, powerful, billowing Lama. You tower over the heads of all. A rosary of one hundred crystal beads. O Illustrious Lama, at your feet I pay homage. And Vajrapani, Lord of the Secret. Appeared, then constantly cared for you. For youself and for all sentient beings. Complete with all mudras and expressions. The fabric of dependent origination. Who touched you with a scripture. You directly perceived his Buddha-form. Were filled with supreme delight. Rested as breathing stopped, and then dissolved. Of the blisses dawned upon you. All Buddhas and Bodhisattvas came forth. Portending that you would master all teachings. You touched the text to your head. More brilliant than a million suns. The might of the power of evil was subdued. By Buddha Vajradhara to guard your doctrine. By both Manjushri and Vajrapani. Limitless as the sky be extinguished. And embraced by the sacred Dharma. Like you, a Jetsun Lama. And not to enter parinirvana.